Jaguar Cars is pleased to announce the release of its innovative rear-seat entertainment technology known as the Rear Screen Connectivity System (RSCS) – an AV panel that allows rear-seat passengers to connect any digital device that has an audio/visual output. This system is available as a retailer fitted accessory only. "With the integration of the Rear Screen Connectivity System, it's the ultimate technology in vehicle personalization," said Brenda Fevrier-Luhs, Jaguar North America Vehicle Accessories Sales & Marketing. "Ideally suited to satisfy all rear-seat passengers and keep them occupied throughout their journey in a Jaguar, the RSCS is extremely versatile and provides a luxury feature not available in all mid-size vehicles. We are the first OE to introduce this scan disc/card reader technology before any other luxury automotive manufacturer." The RSCS consists of two seven-inch LCD screens integrated into the driver and front passenger headrests along with two dual-band infrared wireless headphones. 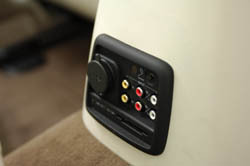 It offers complete versatility allowing rear-seat passengers to connect any digital device from a DVD player to an MP3 player. It also features a slot for memory cards that can be used to for digital photos, videos, pocket PCs, and certain game consoles. Essentially, it's a "futureproof" system with an ability to work with any portable device and effortlessly upgrade to a new device when needed. 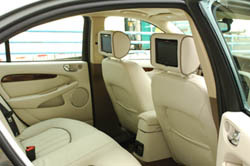 Located on the center console and facing the rear-seat passengers, the system supports two inputs. This allows for two separate devices to be used simultaneously and thus, provides passengers with the freedom to choose their own entertainment. X-TYPES. It also comes in various trim colors matching the vehicle's interior. The suggested retail price is $1,499.00 USD ($1,999.00 Canadian) plus installation. The RSCS for S-TYPE is targeted for August 2006 availability. It's "futureproof" nature, based on its ability to support the use of any portable digital device with an audio/video output. Covered by the new vehicle warranty of four years/50K miles if installed at time of delivery.